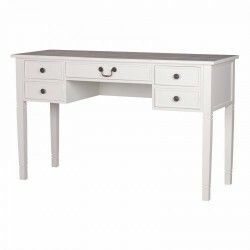 Choose from the wide range of Desks by Exclusive Furniture World. French Cottage Pale Cream DeskDimensions:H78 x W129 x D47 cmMaterial:Hardwood & MDFEAN:649016407..
French mahogany ladies writing desk. The table shows extremely high levels of detailing. Includes a .. The Orland double desk is finished in solid oak with oak veneers and features striking heavy round b.. The Orland single desk is finished in solid oak with oak veneers and features striking heavy round b..
Rustic Writing DeskDimensions: H76 x W130 x D70 cm (chair opening H58 x W52cm)Material: Hardwood &am..
White Reception DeskDimensions: H96 x W100 x D45 cm (chair opening H70.5 x W59.5 x D44 cm)Material: ..